This contemporary acrylic box doubles as a colorful wishing well that will match your Tropical Chic theme with its palme leaves greenery print. Use it to collect your guests' well wishes and marriage advice cards and to store your wedding keepsakes after your special day. 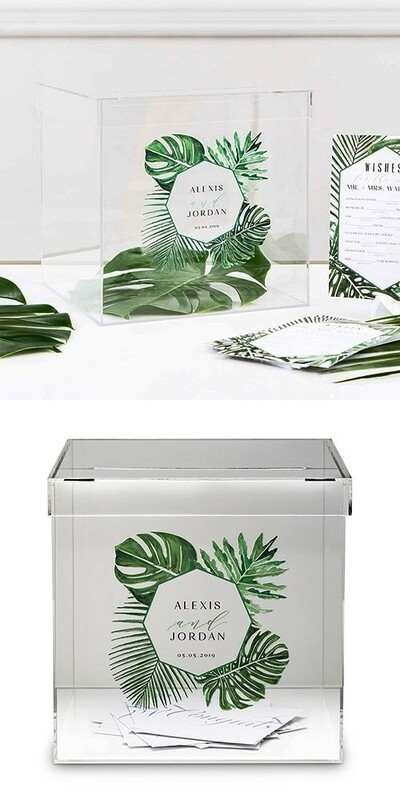 The acrylic box features a removable lid with mail slot and may be engraved with your names and numeric wedding date. PLEASE NOTE: Pictured well wishes cards are NOT included but are available separately. Top Name: Enter 9 letters. Bottom Name: Enter 9 letters.